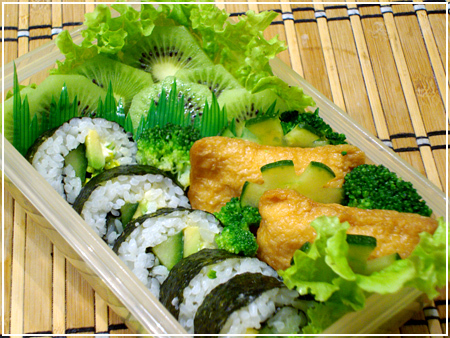 Veggie maki rolls with cucumber, leek, wasabi, mayo and carrot, bottle of soy sauce, inarizushi, Tamagoyaki and more cucumber. 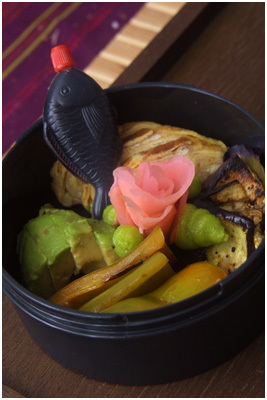 Some dried fruit is tucked in the corner for dessert under the carrot flower decoration. Pumpkin cream soup in the thermos jar. 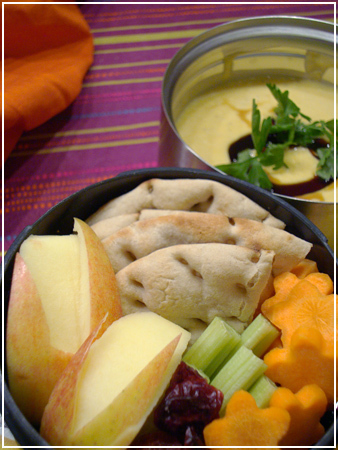 Bread and veggie sticks, apple bunnies and some dried fruit in the extra container. Today I finally managed to get properly in on the green challenge! 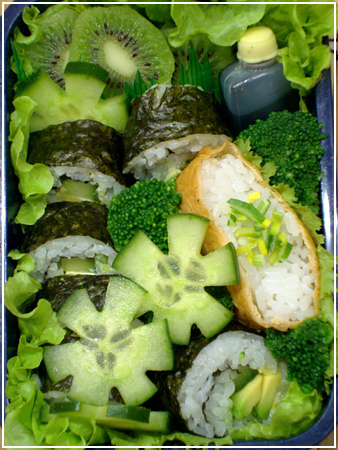 Maki rolls with cucumber, avocado, leek and mayo, inarizushi, broccoli, lettuce and kiwis. Spread out some rice thinly on a small cutting board. I have one that’s exactly the width of a nori leaf, and about 2-3 cm shorter in the other dimension. Perfect! Put a sheet of plastic foil on top of the rice. Pop it into the freezer and stack something frozen on it. Take out after a minute, pull off the sheet (all moisture seemed to stick to the plastic instead of the rice for me, practically) and press the cutting board upside own onto the nori. The rice comes off it easily (I used a spoon to poke it a bit where it resisted), leaving a 1,5cm margin on either side perfect for stacking the veggies and sealing. Rinse, repeat for each sheet of nori. 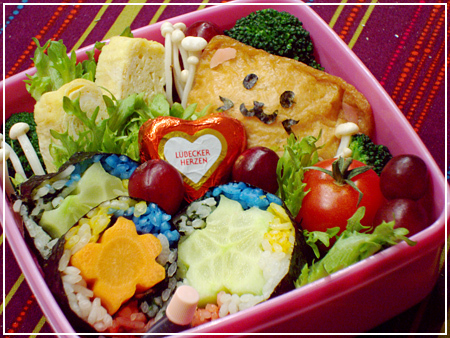 Bento #204 – finally celebratory! This one is finally supposed to get me into a more celebratory mood. 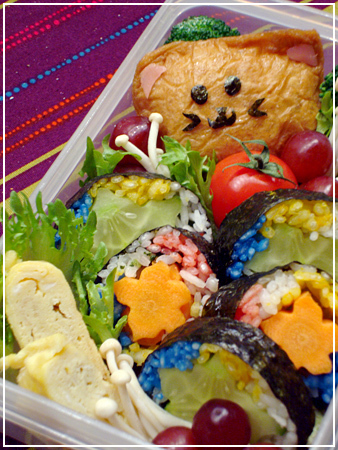 Inarizushi kitten, rainbow maki with carrot and cucumber stars and 5-coloured rice, tamagoyaki and lots of tasty veggies, fruit and chocolate. 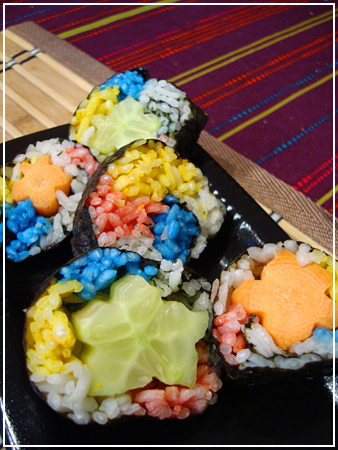 I sacrificed the last of my blue onigiri freezer batch for the maki – now I’ll have to wait until I get new easter egg dyes! (It’s freakishly hard to get hold of blue dye around here.) The yellow is done with turmeric and the green (badly) with spinach, but the red is also food dye – I didn’t feel like bothering, and I wanted a pinkish red, not an orange-ish red like tomatoes give. The last colour is white, so no colouring needed. The BF gets the same in a bigger Curver box. 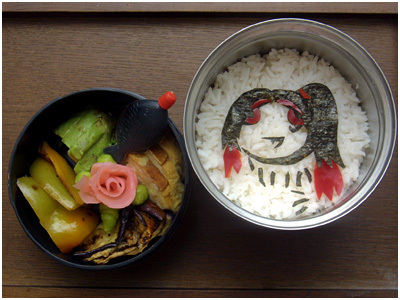 I have more rainbow maki left, so expect another celebration tomorrow! Inarizushi kittens playing in a broccoli forest! 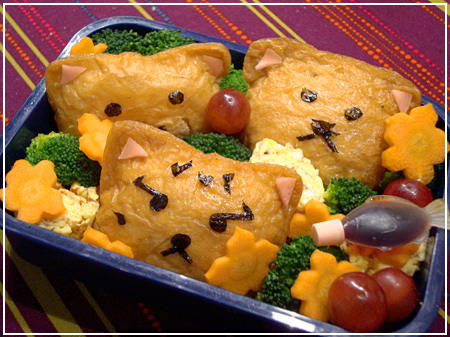 And carrot flowers, a fishy of soy (fits the kittens), three pieces of egglog and some grapes. We’ll see if I can eat them. I don’t often do charaben – well, actually that’s because I really have no patience, but the few I made I had *serious* problems eating! 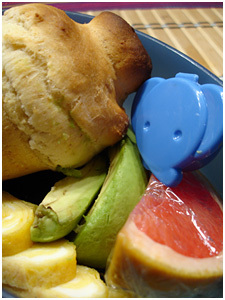 Cuteness and food… is a hard combination for me. 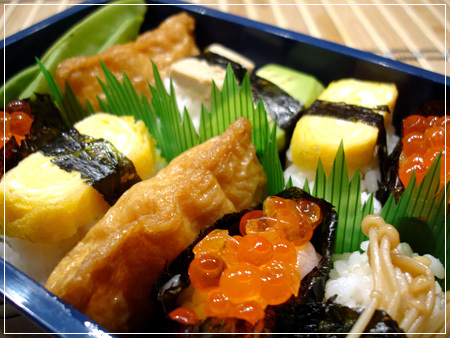 Nigiri with salmon roe, tamagoyaki, avocado, enoki mushrooms and fried tofu on sushi rice. The box held up nicely by the way :) It doesn’t seem to leak anything poisonous and was easy to wash.
I’m only taking one layer of the wooden box today – that’s because the sushi is about the amount of rice I took yesterday, plus the proteins. But don’t worry – I also packed a big breakfast box. In it is a scones muffin (or muffin scone? 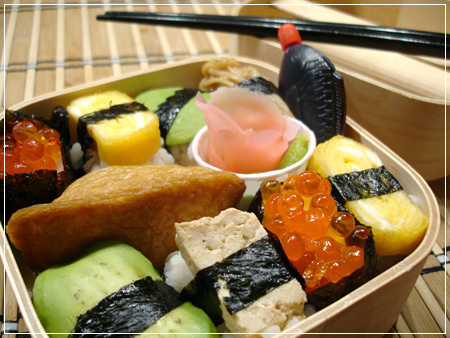 ), a piece of pink grapefruit, some leftover tamagoyaki and avocado and two animal containers – one with creamcheese and one with apricot marmelade. Yum! 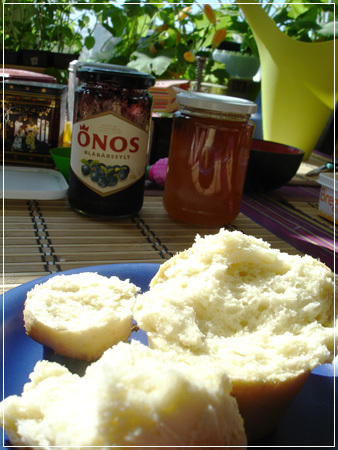 Mmm, fresh scones on a sunday morning… what could be better? A discussion about nori substitutes made me run to the kitchen and demonstrate that eggplants (and oher things) can be used very well to roll sushi rice! Cut an eggplant lengthwise into -very- thin slices. I made them only about 2mm thick. The slices I used for rolling were about 15cm long – if your eggplant is very big, cut slices in half. Salt the slices and lay them out on kitchen paper to draw water. Meanwhile, cook sushi rice, flavour, etc. Dab off the salt and water from the eggplant slices and spray them with oil (garlic oil is especially great!). Fry them on both sides in a very hot oiled pan. Dab off excess oil and let cool. 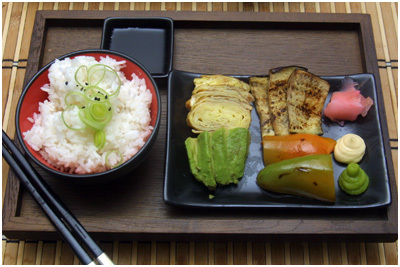 With wet hands, form small nigiri and put them on the lower (wider) end of the eggplant. Roll up. The nigiri should be big enough so the eggplant goes around just about once and a little bit. You can also spread the rice out really thinly over the whole eggplant and roll it up, but that is a bit harder (and might be a problem if the eggplant is really oily). Also, my eggplant tended to try to rip so the nigiri variant was safer. Cut the rolls in half and stand them up on a plate. Voilà! 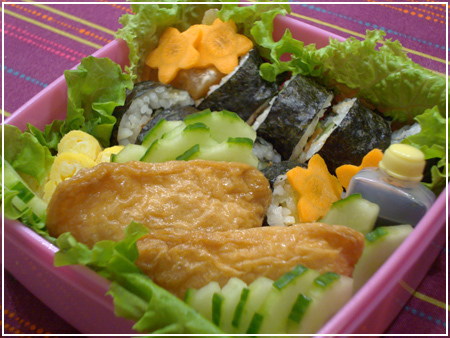 Other “inside out” no-nori ideas shown here are egg (mine is tamagoyaki today though, but on principle omelette works too), and of course my personal favourite, inari pouches. If you don’t like eggplant, I think that zucchini treated the same way as the eggplant would be great too! The eggplant was a great success here – I was fiddling around with my camera before starting to eat, arranging sushi and taking pictures. Then I looked up again, ready to start munching. 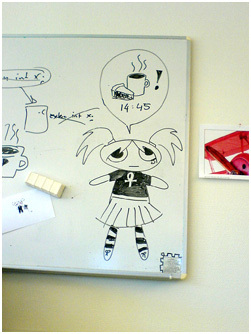 …Can’t be angry at that, now can I?